The Janus line of Common Footprint (CF) Socket Modems are PTCRB and carrier “end device” certified for use in all 2G, 3G, and 4G cellular communication network applications. They provide customers with cost-effective products that are easily integrated into new and existing designs. Their “end device” classification allows users to integrate any certified cellular CF modem into their application with no further requirements allowing for a quick to market solution. 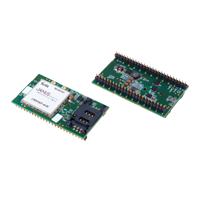 The HSPA910CF v1.00 Socket Modem incorporates Telit’s HE910 penta-band module as its cellular heart. The unit operates in the GSM, GPRS, EDGE, UMTS, and HSPA+ bands, defaulting to the appropriate network. It is pin compatible with the full line of Janus Socket Modem Terminal products. The LTE910CF CAT 3 Socket Modems are available in two versions: LTE910CF v1.00 for AT&T and LTE910CF v3.00 for Verizon. Both versions use Telit LE910's as their cellular engine. The LTE910CF v1.00 (AT&T) units operate in LTE with fallback to GSM in (B17), (B5), and (B2) bands, and defaults to the appropriate network. The LTE910CF v3.00 (Verizon) units operate in LTE only using bands (B13) and (B4). The LTE910CF is pin compatible with the full line of Janus CF Socket Modem Products. The LTE910CF CAT-M1 Socket Modems are available in two versions: LTE910CF v10.00 for AT&T and LTE910CF v11.00 for Verizon. They utilize the Telit ME910C1-NA module as their cellular engine. The LTE910CF v10.00 units operate in LTE bands (B2), (B4), (B12) and (B17). The LTE910CF 11.00 units operate in LTE band (B13). The LTE910CF is pin compatible with the full line of Janus CF modem Products. The new Janus WBZ9113CF v1.00 is a WiFi, Bluetooth, and ZigBee enabled Modem, allowing customers to configure their applications to communicate with the Wireless Local Area Network(s) (WLANs) of their choice. Incorporating the robust Redpine Signals RS9113 System on Chip (SoC), the WBZ9113CF v1.00 is a low-power, dual-band 802.11n WiFi + BT4.0 Bluetooth (classic and BLE) + ZigBee® device with optional GPS. FREE Accessory Kit with purchase of select CF Modems Check it out HERE!